And these are there only to back up the quality of service that you'll receive. When you get your domestic appliance fixed by an Exclusive technician, you'll be getting it repaired by a fully trained and experienced specialist - someone who'll know precisely what to do to return your device to top working condition. Start off by getting a free quote - we provide all the information about the costs involved in your service upfront, so call now! Count on support even in an emergency - we're based locally, so we can be with you very quickly! Thanks to the skills and training of our team, we can provide high quality repairs for almost any kind of domestic appliance. Our experts do their best with oven and washing machine repairs but we can help you with a variety of kitchen appliances. LG, Aeg, Falcon, Smeg, Neff, Baumatic, Hoover, Whirlpool, Rangemaster, Beko, Hotpoint, Zanussi, Samsung, Bosch, Indesit, Siemens, and Cannon. Training and equipment are our two watchwords when it comes to making sure we deliver the highest level of service to you. And you can add "insurance" and "guarantee" to this list too! The experienced and fully qualified professional who'll arrive on your doorstep is part of the Exclusive Repairs team - this means they'll be smartly uniformed, polite, and know exactly what they're doing. 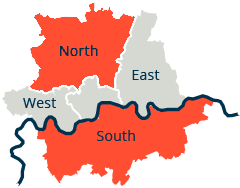 There's no part of the South London area that we don't cover, but if you need our assistance outside of the local area feel free to get in touch at any time to confirm that we cover your area. We work around you - always fitting in with the other things you've got planned, and making sure that the area we work in is both protected and cleaned before we leave. The washing machine won’t spin – This could be due to washing loads, as modern machines have built-in balance protection which protects against damage by refusing to spin. Or it could be a pressure system fault or a failing pressure switch. A damaged or slipping belt could also be the problem, as could a fault with the motor. Some models have a clutch or motor coupler incorporated - any problems with these can be identified visually. Your specialist will inspect, test, and repair or replace any faulty components quickly and effectively. 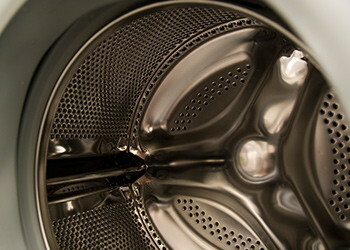 Water not draining from washing machine – If the washer seems to be working normally but simply won’t pump away the water this could be due to a blockage. This could be in the drum, the washing machine outlet hose, the pump chamber, or even the drainage pipe. The washing machine valve cap may need attending to, and pump failure or electrical issues are another two washing machine faults that'll be taken care of by your technician. The washing machine door won’t close – When a fault happens to your washing machine door it often won’t close or open! Your technician will assess the door lock to ensure its engaging correctly, if not the lock may need to be replaced. If the door doesn’t swing or close properly it may be a hinge problem, or it could be an electrical issue. Most faulty locks and seals can easily be replaced and if necessary you’ll be able to get a washing machine door replacement quickly from your repairs expert. The washing machine is leaking – This is often the result of a broken or split pipe that’s circulating water around the machine. The door seal and sump hose will need to be checked, and if the water is dirty the leak may be coming from between the drum and the drainage hose. Your technician will take care of it! Can We Help With Other Appliances? We certainly can! We also offer washing machine repairs in Bromley, tumble dryer repair, and professional fixes for malfunctioning dishwashers of all kinds. In addition, we can treat and fix any issues you might experiencing that might require cooker hood or cooker hob repair. Whenever you've got a problem with your domestic appliances, just call. 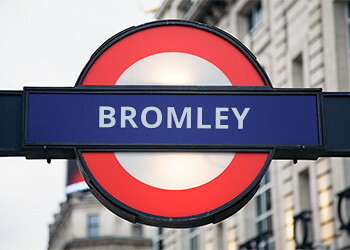 Bromley is a large town in South London and also a post town in the BR postcode area. The borough is a preferred area for young families because of its proximity to central London and good supply of small houses. No matter if you live in Chilehurst, Farnborough, Crystal Palace, Darwin or Chelsfield, our appliance repair services are available all across the 22 wards of The London Borough of Bromley. Other boroughs we cover are Greenwich, Croydon and Lewisham, as well as in other boroughs in South London.